The Nokia Lumia 800 and Nokia Lumia 710, though having the same name, the two devices can be easily differentiated from their chassis. We will compare into more details their specifications. Firstly, both the models run on the same Windows Phone 7.5 (Mango) with 1.4GHz processor. They are both capable of touchscreen and offer the same 480 x 800 pixels on their 3.7-inch display screen. However, when we look into details, the Nokia Lumia 800 offers higher specs compared to the Nokia Lumia 710. Even though both are capable of touchscreen response, the Nokia Lumia 800 uses AMOLED technology, which will look more pleasant to the eyes compared to TFT technology used by the Nokia Lumia 710. It also has a higher internal storage (16GB vs 8GB) and a better main camera (8-megapixel vs 5-megapixel). However, we expect that the pictures will provide the same viewing experience on the device since both of them are using the same resolution for the screen. You’ll only see a difference when the pix are moved into an external PC. On the other hand, the Nokia Lumia 710 appears to have a bigger chassis but is lighter than the Nokia Lumia 800 (125.5g vs 142g). Also, it offers more variety of colours for the casing compared to the Nokia Lumia 800 (10-colours vs 3-colours). Touted as Nokia’s “first real Windows Phone”, the Nokia Lumia 800 is the Windows Phone 7.5 (Mango) flagship by Nokia. It shares the same exterior design with the Nokia N9, but with an additional camera shutter button on the bottom right of the phone. It has a smaller display than the N9 to make space for the three touch buttons (Back, Start and Search) on Windows Phone platform. It includes some exclusive goodies such as free 25GB SkyDrive cloud storage, Nokia Drive turn-by-turn voice navigation free app and Nokia Music with Mix Radio. Spec-wise, the Lumia 800 has a 3.7-inch WVGA (480 x 800) AMOLED display with ClearBlack technology, a 1.4GHz processor, 512MB of RAM, 16GB internal storage, 8-megapixel camera with Carl Zeiss optics and supports HSDPA 14.4Mbps, WiFi 802.11 b/g/n and Bluetooth 2.1. The Nokia Lumia 710 is designed for instant social experiences and image sharing. The device is built on Windows Phone 7.5 and brings the clear browsing experience with IE9 hardware accelerated graphics and HTML5 support. Other key features include a 5-megapixel camera with continuous Auto Focus and LED flash. Develop apps for this device with XNA and Silverlight frameworks and build web experiences using Internet Explorer 9. The purposely built, no-nonsense Nokia Lumia 710 can be personalized with exchangeable back covers and thousands of apps to bring the Lumia experience to more people around the world. 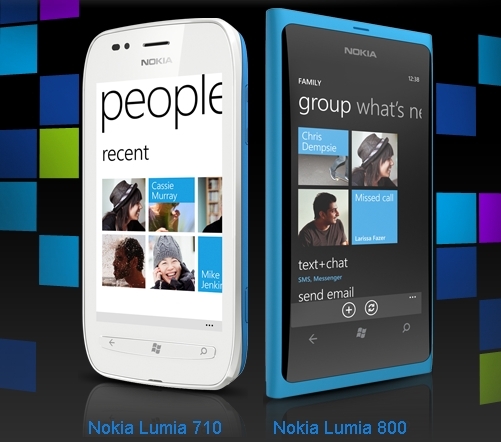 The Nokia Lumia 710 is designed for instant social & image sharing. It is available in black and white with black, white, cyan, fuchsia and yellow back covers. With the same 1.4 GHz processor, hardware acceleration and graphics processor, the Nokia Lumia 710 delivers high performance at an affordable price.